Most people don’t even know they have plumbing problems until experience a water leak in one form or another. 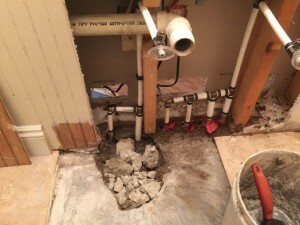 The most common types of water leaks are pin hole leak & Slab Leak, unfortunately, these kind of water leaks are common in southern California because of the use of copper pipe that was sourced from Mexico and manufactured from recycled copper pipe material in China. The problem is that there is a detrimental chemical reaction that Chloramine which is added to the water supply has on copper piping to the point that it actually eats holes into the copper which results in common plumbing problems like pin hole leak or slab leak. Another common plumbing problem is low water pressure. This can often be the case with old galvanized pipes. Over time zinc erodes from the inside of galvanized pipes and causes a buildup which is usually the culprit behind low water pressure. Copper and galvanized pipe are inferior to PEX and can lead to high water bills, low water pressure and costly repairs to your home because of water damage due to leaks. The most cost effective and permanent solution for your home is to get a PEX repipe! Sound of running water when all water is turned off A hot or cold spot on the floor New cracks in walls or flooring Excessive moisture under carpets & High water bills. We do Slab Leak Detection Without Destruction! Using Ultrasonic Meters, Infrared Thermometers, Digital Acoustic Technology, and Thermal Imaging, we can find your leak without damaging your home. 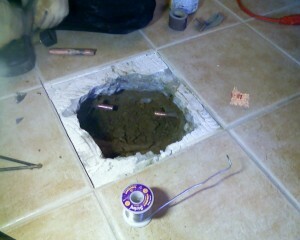 We open up the slab at the spot of the slab leak and repair leaking pipe. This option is very cost effective for newer construction. In-place pipe coating is applied through the inside of plumbing. This is mostly prescribed for a system that has a series of leaks, rendering the normal repair cost prohibitive, or if it is too inconvenient to dig up the slab. If you have a slab leak, we can replace the entire line that was leaking. This is most effective for older plumbing systems that have a history of leaking.